Borneo Black - Lampropelma sp. 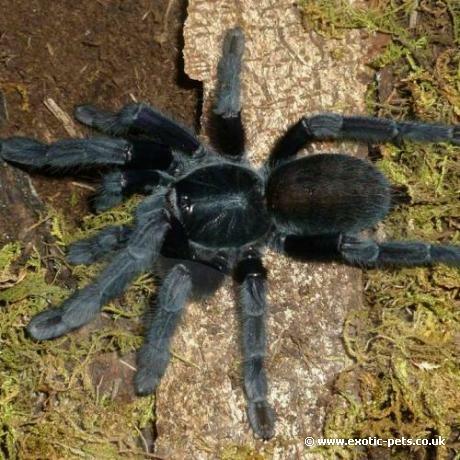 The Borneo Black is a large Asian arboreal tarantula from the subfamily Ornithoctoninae. What does the Borneo Black Tarantula look like? This is a large species of tarantula with legspans reaching between 12-15cm. Overall the spider has a stout jet black appearance with a subdued tiger pattern accross the abdomen. There is a distinct difference between the two sexes once they reach large juvenile. Males will become more reddish to tan in appearance and females will remain jet black. Males of this species will normally mature at 18 months where as females can be sexually mature in 2 years but not fully grown until 3 or 4 years old. Where are Borneo Black Tarantulas from? These spiders are found in Central, South and East Kalimantan, the Sabah state in Malaysian Borneo and also Indonesian Borneo. They are normally found in monsoon rainforest where they live in hollow trees high off the ground. How do you keep Borneo Black Tarantulas? Like all species of arboreal tarantula, these spiders require a hollow log or cork bark tube as a retreat. Deep and loose substrate is also important as they do like to dig out a snug home and silk all around. A good rule of thumb is to try and provide a depth of substrate matching the same depth as the spiders legspan. These spiders need to be kept at temperatures of 24-28 degrees celcius dropping no lower than 20 degrees celcius at night.